In case you didn’t hear, Klay Thompson had a pretty incredible game on Monday in Chicago. He had 14 3-pointers, setting a single-game NBA record for treys that was previously held by Stephen Curry, who made 13 treys in a game about two years ago. And oh by the way, the Dubs won the game, setting a franchise record with 92 points IN THE FIRST HALF. 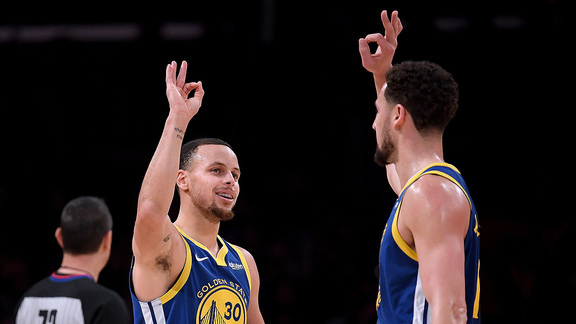 Here are a few nuggets that you may have missed from what was another are-you-kidding-me Warriors performance this season. 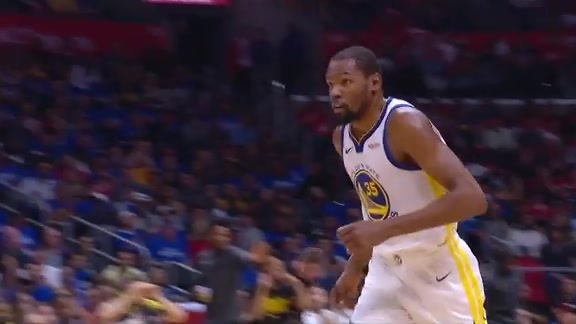 With about 10:15 left in the third quarter, Thompson collided with Damian Jones on the perimeter and the Splash Brother was left with a gash on his forehead that would later require a couple stitches. Blood, sweat and lots of SPLASH. Thompson would hit two more threes, his 11th and 12th of the game before putting on a bandage and headband to stop the bleeding with about 8:02 left in the third quarter. With the gold headband on, Thompson missed his first 3-point attempt but he’d connect on the next one to tie Curry’s record. At that point, the offense was simple: Get the ball to Klay; Klay shoot. After making 13 threes, Thompson missed on four straight 3-point attempts. But the Chicago crowd, with the game out of hand, was all in supporting Klay. And Thompson rewarded them when he caught a pass from Kevin Durant on the right wing, took one dribble to his left, set his feet, launched and … SPLASH. With 4:53 left in the period, Thompson took sole possession of the NBA record for 3-pointers in a game. Asked after the game if he liked the new headband look, Thompson responded: "I do (laughter). I look like Jackie Moon out there. He's probably one of my favorite characters in all sports movies." Here is a list of records tied and/or broken in the Dubs’ 149-124 win over the Bulls. The location of Thompson’s 14 treys were spread around the perimeter, somewhat similar to the 3-Point Contest at All-Star Weekend with one notable exception. None of Klay’s 3-pointers came from straight away. Instead, he made four from the right corner, four from the right wing, four from the left wing, and two from the left corner. All 14 of Klay Thompson's threes from his NBA record setting performance in Chicago! Klay’s early season struggles from distance were no secret. He entered the game shooting 5-for-36 on 3-pointers this season. But perhaps that was necessary for this breakout performance. Two years ago, Stephen Curry went 0-for-10 on 3-pointers in a Warriors loss to the Lakers in L.A. That ended Curry’s NBA record streak of 157 consecutive games with at least one made 3-pointer. The very next game, Curry went 13-for-17 on 3-pointers to break the previous record of 12 that he shared with himself, Kobe Bryant and former Warrior Donyell Marshall. This marked the third time that Thompson has scored at least 50 points in a game, and the first time he ever did it on the road. 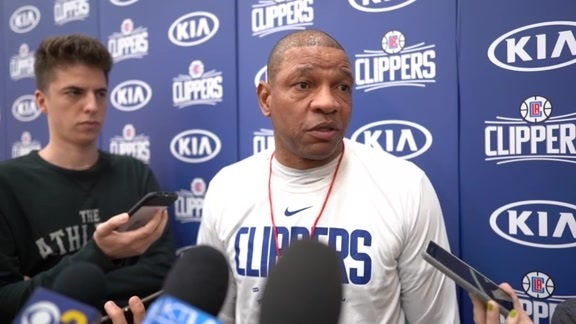 He also had 52 in a game that’s more remembered for his 37 points in a single quarter against the Kings on January 23, 2015, and he had a career-high 60 points against Indiana on December 5, 2016. 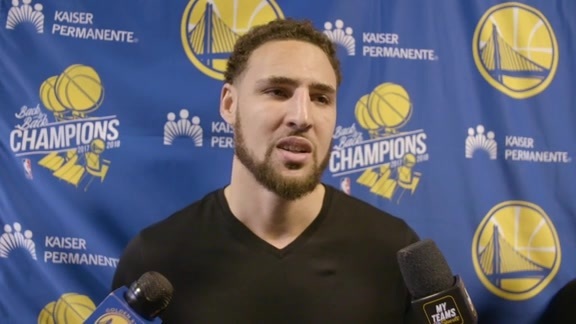 In both the 60-point game and on Monday, Klay played fewer than 30 minutes, making him the only player in NBA history to score at least 50 points in fewer than 30 minutes. Not surprisingly, NBA Twitter was straight fire on Monday. Here are some of the top tweets around the league. Two weeks into the season, there are already several signature moments for the Dubs. October 19: Jonas Jerebko’s game-winning tip-in against his former team. 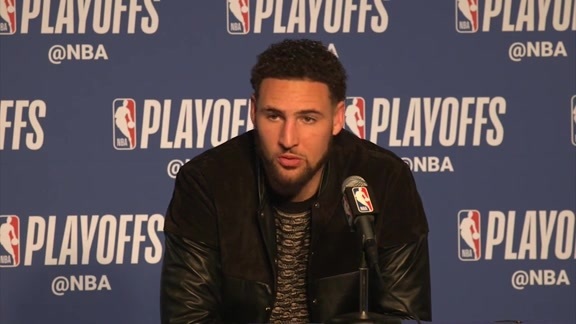 October 29: Klay’s NBA record of 14 3-pointers in a 52-point night. At this pace, there will be at least two more all-time classic performances during this upcoming five-game homestand that tips off on Wednesday with a Halloween special against the Pelicans. Can’t wait to see what’s next!